Moreton Island is just a couple of hours away from Brisbane…and a world of difference from city life. In just 30 minutes travelling east from the CBD is a hidden secret to most city dwellers. I left from home and in less than 15 minutes was checking in to the MICAT terminal on Howard Smith Drive close to the Port of Brisbane. We were all on board the MICAT ferry for the 8.30am departure and the welcome sight of a 'real' coffee machine with distant memories of past ferry trips polystyrene cups with a dash of instant coffee. 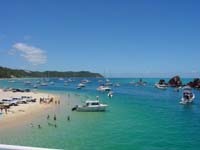 I settled at the front of the plus 600 person capacity ferry with ample views of the journey ahead to Moreton Island. Giant Lego blocks of containers seemed to float past us alongside the Brisbane River. Within what felt the blink of an eyelid the magnificent sand dunes of the island and the Tangalooma Wrecks were upon us. The ferry anchored by Wrecks and we were quickly off the boat on to the 4WD for a Moreton Island Eco Explorer Tour with our knowledgeable guide Kim. She had an answer for all questions, from the eagles flying overhead to the venomous snakes on the island and that there were no traditional Australian mammals. With over 98% of the island designated as a National Park the island is a great opportunity for visitors to enjoy an un-spoilt island environment. Our eco adventure took us along the track that traverses the middle of the island to soon be on its pristine eastern side with empty beaches stretching as far as the eye could see. Along the way we saw kites swooping down over the dunes. We stopped on our journey north to see the Blue Lagoon and the brown hue made up of tee tree oils. A delight to swim and very therapeutic as our guide testified. Soon we were back in the 4WD heading to the northern most point of the island to the historic Moreton Lighthouse and a great information centre with exhibits and interpretation panels about the varied history of the island, its settlement and nature. To our delight, with the 360degree views we could spot whales just out to sea clearly with their spouts making their mark. One of the group even saw a shark swimming close to the rocky bay. We carried on to Honeymoon Bay that well bellies its name with a beautiful vista for the most ardent romantic.Then a windy trek along the tracks that led us to Bulwer, the main centre on the island. The Bulwer store has had a makeover in recent years and is well stocked with all the provisions you need for a stay on the island. The lunches were well presented with my chicken parmigiana and salad providing a colourful array of culinary delight. Above and behind the store is Castaways providing a variety of accommodation with dorms for groups and well equipped units for families or adults. Winter package prices start from $240 for a walk on for a family of four. Adjacent to the units are the new glamping tents…short for 'glamour camping' that certainly makes camping comfortable with wooden floors, double beds for the adults and bunks for the kids…all with your own en-suite. Soon it was back in the 4WD along the beach and tracks to the waiting ferry. Just time for a wander around The Wrecks camp site to see the designated spaces for each camper. The site has no facilities so one for the ardent camper. It's just a short walk from the ferry and metres from the beach and the opportunity to witness the spectacle of a sunset over the mainland. That was to await another day as the temptation was too great for me not to dip my toes and body for a lovely cooling swim before embarking on the ferry for my trip home. Within 75 minutes I was in my car parked at the terminal and home by 5.30pm. Moreton Island is a great destination to visit anytime of the year but winter is a special time with warm days, no crowds and special deals making it a very affordable day trip or a short stay. A simple walk on rate is $35 per person mid-week and $45 at weekends, and that includes a morning tea. For the many and varied packages visit the Moreton Island Adventures website or call the booking office on 3909 3333. Why? A hidden secret to most city dwellers.